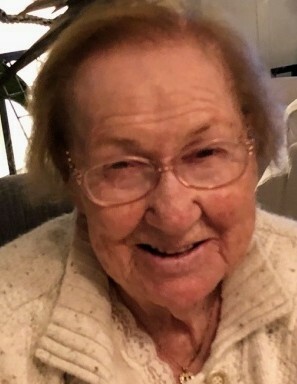 Iva J. Mollohan, 95, passed away November 24, 2018 in Boca Raton, FL. She was born in Clay, WV to the late Jacob and Anna Argabrite, lived most of her life in Akron, and moved to Florida 16 years ago. Iva worked for Goodyear during World War II and was a long-time member of Millheim Baptist Church. She was a beloved and devoted mother, grandmother, great-grandmother and great-great grandmother and will be deeply missed. In addition to her parents, she was preceded in death by her husband, Lantz, and 11 brothers and sisters. She is survived by her daughters, JoAnn Pickering (Robert Soifer) and Peggy (Don) Agner; grandchildren, Melissa (Dave) Smallwood, Jason (Renee) Lancaster and Dawn (Mac) Settipani; great-grandchildren, Samantha, Grace, Naomi and Wyatt; and great-great grandchildren, Eli and Jack. Calling hours will be on Thursday, November 29, 2018 from 4 – 6 p.m. at the Eckard Baldwin Funeral Home and Chapel, 760 E. Market St. The funeral service will be at the funeral home on Friday, November 30, at 11 a.m. with Rev. Kim Lawrence officiating. Interment at Hillside Memorial Park.